Some winds have standard behaviors. Planet Earth is inhabited by several regional winds which appear and blow with pattern rules. Air temperature, land temperature, water temperature, mountains and geographical locations play critical roles in the behavior of the famous winds of the world. Windsurfers, kitesurfers and also wave-powered water sports rely on special winds to get quality surf sessions. Consistency and power are important issues when it comes to wind and board sports. After learning what is wind and how wind is formed, it's important to know what are the best winds in your region for windsurfing, kitesurfing and even riding waves. With good anemometers, you can easily check the wind speed and air pressure. 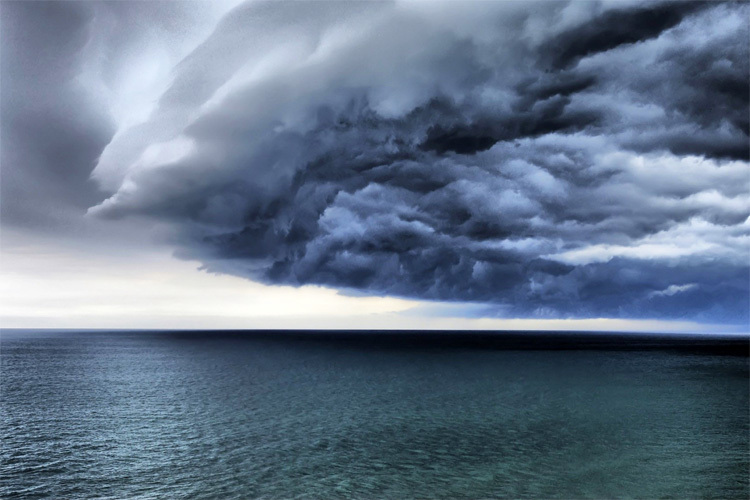 Cloud types also tell us much about weather patterns, while the Beaufort Wind Force Scale relates wind speed to observed conditions at sea or on land. Famous winds have their working schedule, too. Some winds blow strong in the morning and fade out during the afternoon. Other winds have special requirements and will only appear in drastic temperature changes. 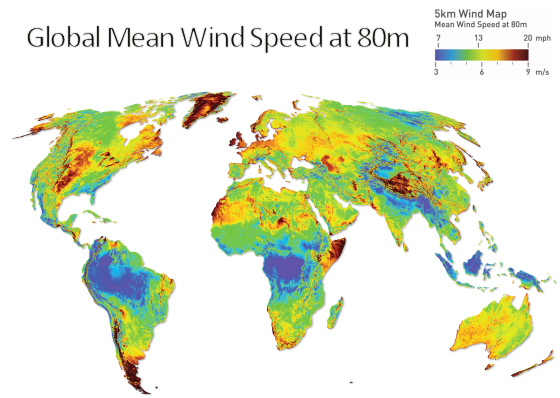 So, what are the most famous winds of the world? Abrolhos: a violent squall blowing off the Southeastern coast of Brazil, between May and August. Alizé: also known as trade wind; blows in the tropics predominantly from the Northeast in the Northern Hemisphere and from the Southeast in the Southern Hemisphere. Bora: a gusty wind which blows in the Adriatic Sea, and affects Croatia, Greece, Russia and Turkey during wintertime. Brickfielder: a hot and dry wind that blows in the desert of Southern Australia, during summer season. Calima: a dust wind originating in the Sahara which blows through the Canary Islands, in winter. Cers: a quite violent dry and clear Northwest or North wind affecting the Southwest of France, near the Gulf of Lion. Chinook: a Katabatic, dry and effective wind that melts snow in the Pacific Northwest of USA and Canada. Diablo: hot, dry and offshore wind blowing in the San Francisco Bay Area, during spring and fall. Etesian: strong, dry, north winds of the Aegean Sea which blow from about mid-May to mid-September, hitting Greece and Turkey. Föhn: a Katabatic, dry mountain wind that can raise the air temperature very quickly over the Alps into Central Europe. Halny: a type of Föhn wind that blows in Southern Poland and Slovakia; can destroy roofs and cause avalanches. Hamsin: a dry, hot and dusty local wind blowing in North Africa and the Arabian Peninsula, between March and May. Harmattan: a dry and dusty West African trade wind blowing south from the Sahara into the Gulf of Guinea, between November and March; it causes a haze in the sky. Helm: a strong north-easterly wind which blows in Cumbria, England. Levante: a warm, east to northeast wind that runs in the Alboran Channel and is funneled through the Strait of Gibraltar; strong Levante winds produce heavy swell. Mistral: a strong, cold and usually dry regional wind that affects the Southeastern region of France and the entire Mediterranean Sea. Monsoon: a seasonal reversing wind that bring precipitation to South Asia. Pampero: a strong squall that occurs over the Pampas of Argentina and Uruguay, between October and January; brings a considerable drop in temperature, severe rain, thunderstorms and is followed by a cold, dry, gusty wind. Santa Ana: a hot, dry easterly or northeasterly wind and blows from the pass and river valley of Santa Ana, in Southern California; very common in Los Angeles and also known as Sundowner. Simoom: a suffocating, strong, dry, dust-laden local wind that blows in the Sahara, Palestine, Israel, Jordan, Syria and the deserts of Arabian Peninsula. Sirocco: a Mediterranean wind that comes from the Sahara and reaches hurricane speeds in North Africa and Southern Europe. Tramontana: a cold wind from the north or northeast tinged with frigid air from the Alps and northern Apennines, particularly to the west coast of Italy and Northern Corsica. Vendaval: a strong, wet and moist south-west wind associated with cyclonic activity across the Iberian Peninsula; blows during the wet winter season, from November to April and comes with violent squalls and thunder. Zonda: a hot wind of the eastern slopes of the Andes, in central Argentina; starts during the afternoon, between May and November. Windsurfing and kiteboarding are wind-powered water sports. Wind is the soul of sailing, but where does wind come from? All sailing crafts depend on the strength and direction of the wind. Sails and kites are driven by the power of winds. Wind is responsible for the creation of waves. As wind touches the surface of the oceans, it helps the formation of swell, sometimes far away from continental shores. It is quite easy to understand how wind is formed. The atmosphere and its four layers rise more than 100 kilometres above the crust of the Earth. In this aerial region - troposphere, stratosphere, mesosphere and termosphere - there are several gases flowing around which, for example, help give the blue tone to our skies. Wind is simply the result of the differences of pressure in the atmosphere. A baloon loses its air because the higher inside pressure finds less pressure on the outside and flows off. There are three types of wind, when it comes to the duration of the blow. Short strong winds are usually called gusts. Termed squalls are intermediate strong winds and durable strong winds may be a typhoon, hurricane, storm, gale or breeze. 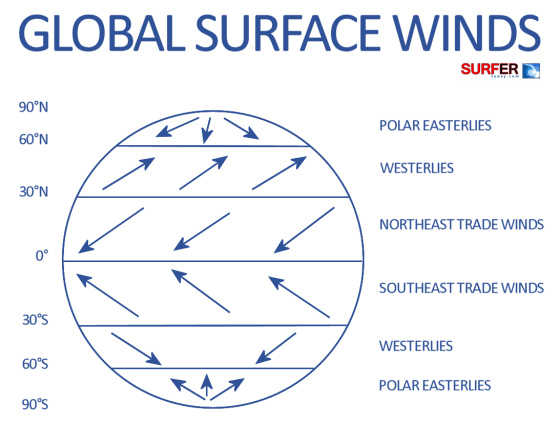 Physical forces such as the rotation of the Earth, Coriolis effect, geomorphology of the planet's surface, solar energy and gravity are responsible for the distribution of multiple wind systems over the globe. The strongest wind gust ever was registered in the automatic weather station of Barrow Island, Australia, on the 10th April 1996. The local anemometer marked 408 km/h (220 knots, 253 mph) and was mounted 10 meters above sea level. The windiest region in the world is Cape Farewell, in Greenland. Planes only flew over this Antarctica spot, for the first time, in 2008, because of the strong blows that inhabit the place. Wind can blow anywhere, anytime and in any direction. The official measurement format for grading the power of winds are knots. If you want to measure wind speed, it is important to use an accurate digital anemometer. There are several portable anemometers in the market. Learn how waves are formed, here. Check the Wind Speed Direction and Forecast for your region, here. How is a wave formed? The surf report, the swell and surf forecasts are a result of scientific studies and weather prediction models. In order to know what type of surf we will get in the next days, it's important to learn how waves are created. Waves are mainly a product of the wind. The best waves for surfing are the result of the interaction of winds on the surface of the ocean, far away from the coast. Wind is the first step in the formation of surfable waves. Local shore winds can also produce waves, but they can also destroy the quality of the breaking waves. Onshore winds are typically known for creating choppy and bumpy waves because their effect is added to the direction of the wave. In a way, offshore winds are a sort of a counterbalance. Swell comes from miles away and the ground wind works as a "pause-hold" effect on the wave face, allowing longer unbreakable waves. In theory, low pressure systems are responsible for creating good and strong waves. In deep low pressure systems, wind speed is greater and more waves are generated by the power of the gusts. The friction created by these winds helps to form energy waves that will travel thousands of miles until hitting final obstacles, which means, coastal areas where we live. Also, if low pressure winds affect a very large area of the ocean, all waves produced by the swell will have even more energy and power, resulting in even bigger waves. We've already analyzed the "birth" of swell and correspondent waves, but there's a large distance to be traveled by those waves. Original oceanic waves may have to run a long journey until they reach continental beaches. Along the way, until they are ridden by surfers, these waves will have to challenge other variables. The height of a wave when it is created is not the height of the waves that is ridden by a surfer. Waves make their way through the ocean and are affected by the differences in the ocean floor. When large volumes of water move and pass by higher sea floors, the overall energy of the swell is changed. For example, offshore continental shelves are friction resistances to moving waves and when these waves reach coastal areas in shallow water conditions, swell has already lost intensity, energy and power. When waves travel without obstacles, in deep water regions, they tend to reach a beachfront with huge force. Bathymetry studies the underwater depth of ocean floors and its changes over time. 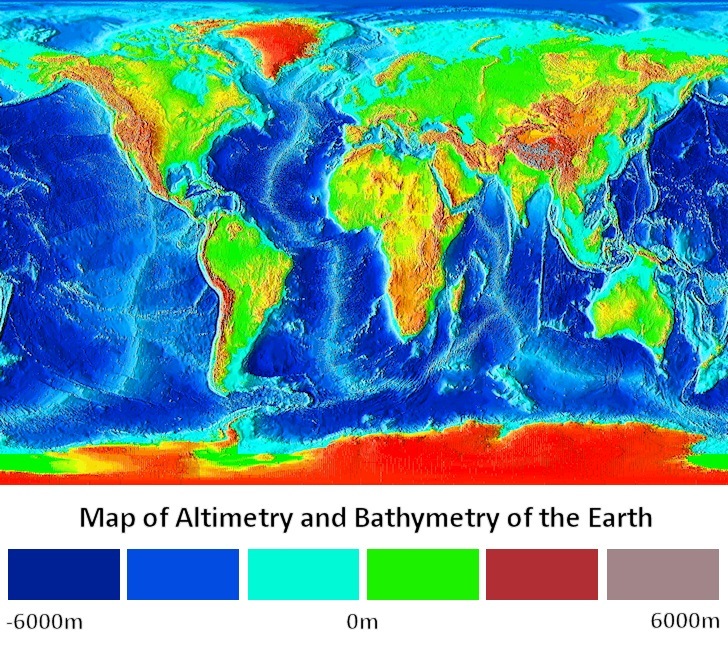 In the bathymetric map, its easy to understand the highest and lowest depths on the entire planet Earth. Sea floor topography is very important to avoid disasters and accidents with ships and line cruisers. Also, the study of sea floor can deliver precious forecasting information for your local surf spot. When waves reach shallow waters they tend to slow down. 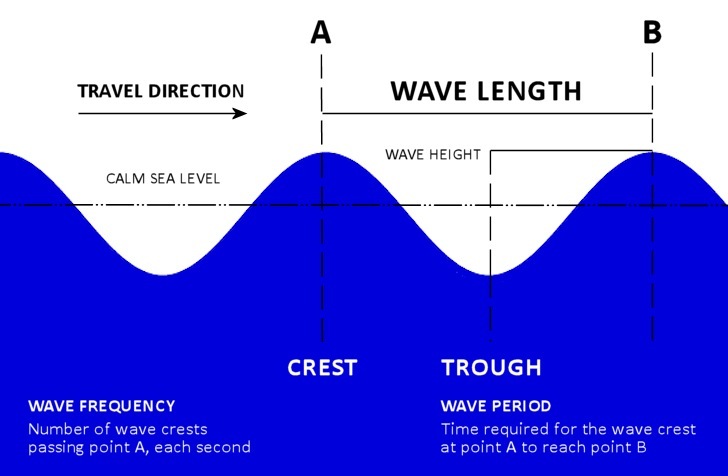 Despite that, wavelength is shortened and the crest of waves grows, meaning that the wave height rises. Sand banks, for instance, are always changing in beach breaks. Thats why the quality of the waves is better or worse through time. The sand bumps in the ocean floor allow the formation of clear and localized wave peaks, from where surfers can take off on a ride. A new sand bank normally means a new wave peak because swell hits the sand obstacle and pumps the wave crest allowing surfable waves. Other swell obstacles are jetties, sunken boats or simply natural and artificial reefs. Waves start wind winds and are influenced by sea floor, rainfall, tides, coastal backwash currents and local winds and sea bottoms. All these weather and geological variables result in waves for surfers, kitesurfers, windsurfers and bodyboarders. Learn what is wind and how wind is formed. Now, check the wave height forecast for your local spot.